This automatic winding 1956 stainless steel ref. 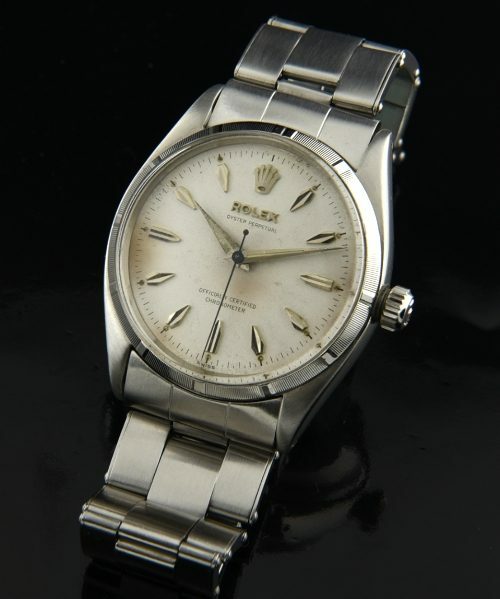 6565 ROLEX is an original example measuring 34mm. in stainless steel and has a completely original dial having steel arrow markers and original Dauphine hands. The caliber 1030 ROLEX automatic movement was cleaned and accurate. This fine ROLEX movement is also used in the valuable ROLEX SUBMARINER from the same era. We are including a vintage riveted ROLEX OYSTER riveted bracelet to complete the look an enhance the value. The stainless case and engine turned bezel look VERY good for the age of this watch. In my photograph, the crown is not screwed down all the way. It has a new crown and tube. This watch, in fact has even being water tested. I would not advise to swim with it, but it did pass the test. This is a fantastic ROLEX. Priced at only $2950 with the ROLEX riveted bracelet-this is a great bargain for an original 50’s automatic ROLEX.